The FT-CLAMP series has been discontinued. Please contact our Flow Engineering department for a viable replacement. 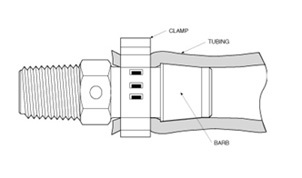 Clamps must be used with all fittings which have anti-rotation devices. Never place a clamp over the large diameter of a barb. Clamps work best when tightened around the recess behind the barb. For best results, place the clamp behind the barb and over the anti-rotation device. Anti-rotation devices are small oval-shaped raised areas which inhibit hose rotation on the barb. Rotation of the hose on the barb is responsible for many of the leaks that occur with other fittings. OMEGA’s threads are molded in precision-ground cavities, resulting in perfectly matched threads at the parting line. Although this manufacturing method is the most costly, it produces the cleanest, most accurate molded thread possible. OMEGA’s single-barbed fittings are made so that the molded-in parting line stops at the base of the barb. The ridge and the conical surface are free of the molded-in leak path. The conical surface on the fitting is smooth and glass-like, for excellent sealing. Clamping the relaxed hose behind the barb causes the clamp to work like a drawstring, forcing the diameter of the hose to become smaller than the flare of the fitting barb. If the tubing swells due to internal pressure (approaching burst pressure), the clamp will be pulled up tight to the back of the barb and the seal will be maintained. When clamps are placed over an OMEGA ® exclusive anti-rotation device, the tubing cannot be freed by twisting. Tooling mismatches often occur in poor-quality fittings, causing mismatched threads and barbs and resulting in leakage. Tooling cannot be designed so as to avoid the formation of a parting line on multiple barb fittings. This parting line creates a leak path which becomes more pronounced as the tool experiences wear. 1. Clamping on top of barbs in an attempt to force the tube down behind the barbs can cause damage. Doing this will round off the sharp edges of the barb and cause it to bite less deeply and securely into the tube. 2. The clamping pressure causes the tube to flare out behind the clamp. Barbs located behind the clamp will have little or no effect. Multiple barbs are typically placed in close succession. This prevents the tubing from relaxing to its original size, which is essential to the barb’s performance. If the tubing does not relax behind the barb, the barb is rendered useless, as shown above (note the bridging effect). ADDITIONAL NOTE: Brass fittings are machined and do not have the problem of molded-in parting lines. However, brass fittings are usually designed with multiple barbs and have the other problem characteristics shown above. In addition, machinable brass contains free lead. Brass parts cannot be used in any system where internal heavy metals are undesirable or dangerous. Please download PDF file for full specifications. 참고: Brass fittings are machined and do not have the problem of molded-in parting lines. However, brass fittings are usually designed with multiple barbs and have the other problem characteristics shown above. In addition, machinable brass contains free lead. Brass parts cannot be used in any system where internal heavy metals are undesirable or dangerous.